Long before Halloween, people used to eat pumpkin! I know, call me crazy but it’s a squash, it’s for eating…ya ya it makes a fantastic Jack-o-lantern too. I’m just saying that in days of old the native people actually grew them for eating. They were also used as a defense, a kind of barbed wire. It’s a growing technique coined as the Three Sisters, corn, squash and beans. The corn was planted in the center, the beans grew up the corn and the spiky squash plant was placed at base of both plants to protect them from critters. 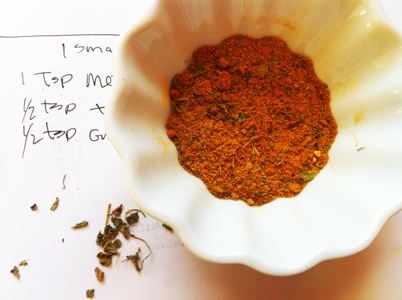 One way I love to use pumpkin is with lots of spices, it is a wonderful way to get the kids used to highly flavored foods without being spicy “hot”. Pumpkin and curry is classic in Thai food and we just love coconut at our house, so it’s a perfect match. The problem with pumpkins is that they can be tough little buggers to cut into. I have a drawer full of knives, big ones so I’m covered, If you don’t here is a trick. Carefully stab a few slits in your pumpkin, place in microwave for 5 minutes. Remove it, hold it with a towel and cut in to peices. It should be softer but depending on the size it may need more time. One of the spices I use in my cooking is methi, the leaves of the Fennegreek plant. They are distinct and subtle and add that Eastern flavor. Crush the Methi in your fingers to release the fragrance before using. It is always easier to cut produce wityh the flat side down so it stays put. 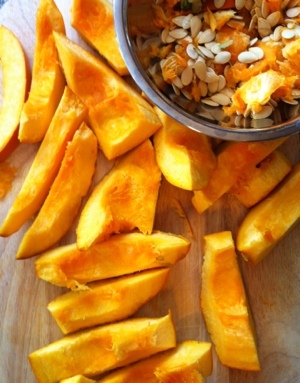 Cut pumpkin in half, scoop out all the seeds and set them aside for roasting. 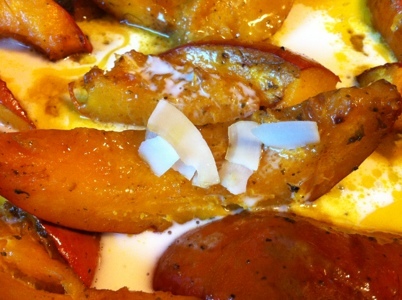 Cut the pumpkin in half and then into wedges or chunks. Try to make them similar sizes so they will cook evenly. Place wedges peel side down into a 9 x 13 inch baking dish. 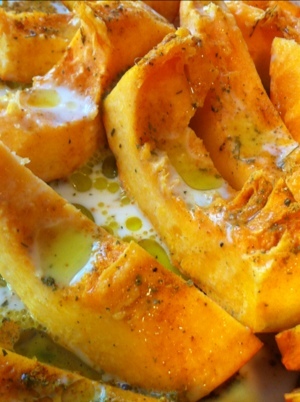 using a pastry brush, coat the pumpkin flesh with the coconut oil. Pour the coconut milk drizzling it all over the pieces. Sprinkle the spice mixture over the pieces. Bake for about 45 minutes or until pumpkin is soft. Serve with Jasmine rice, sautéed spinach and chickpeas. Trader Joe’s has a new product called Roasted Coconut Chips, this is my version of heaven. They are really good sprinkled on this dish after cooking! This is perfect for after your family has carved pumpkins, you should have lots of seeds. 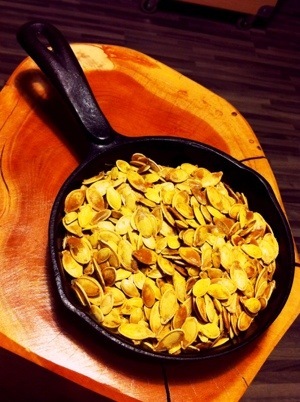 Toss pumpkin seeds in a bowl with melted butter or oil and salt. Spread pumpkin seeds on a rimmed baking sheet in one layer. Bake for about 45-1 hour minutes, stirring occasionally, until golden brown. Cool on sheet, put in a pretty container. 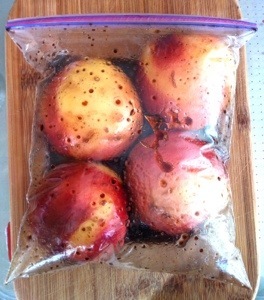 Keep at room temperature sealed for up to a week. Chicken pot pie is not nearly as daunting a project as you may think. I know it sounds fussy with all that dough, sauce making, chicken cooking, chopping and so on. It is really just a matter of tossing everything in a pan and adding some kind of doughy top. I got all excited one night while I was cooking some chicken and though these would be a prefect thing to make the next night for dinner. Because I’d already cooked the chicken and would use the leftovers for the pies, it would be so easy. Then I remembered I don’t have those cute little pots that are special for making individual chicken pot pie in. I have a million small dishes, but like Goldie Locks and the Three Bears, none were just right, some were too small and some were too large. 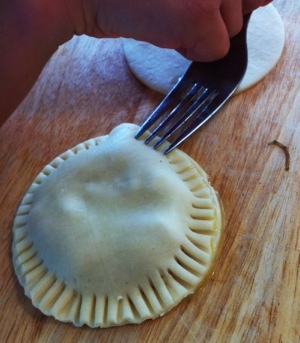 Then I thought who needs those stinkin’ mini pots anyway, I’ll make hand pies and then I won’t even have to wash forks after dinner because you eat these with your hands! Brilliant. So I made the filling that evening after dinner and snuggled it right in the fridge for the next day. I was lucky enough to have some homemade chicken stock on hand. I was unlucky because I had a house of sick people, precisely why I had chicken stock. The next day I had to grab some stuff at the store anyway so I tossed in a pre made pie dough, you can get fairly healthy ones at a natural market. 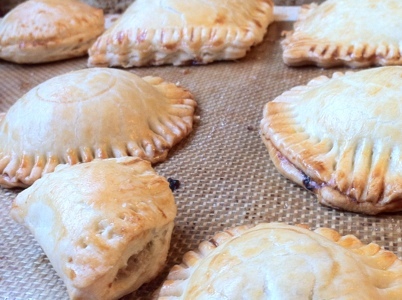 You could use puff dough If you can’t find pie dough. I enlisted the help of my daughter in making these, she picked the size and shapes for the pies. We cut out the dough with cookie cutters, brushed them with egg, filled them and sealed them. Chilling the mixture makes easy work of filling the little pies when it’s time. We assembled them around 3 o’clock and put them back in the refrigerator until it was time to bake them before dinner. You could also freeze them raw for another day. They baked up really pretty and were equally as tasty. You can try adding anything, make them vegetarian even, just use your creative genius. Serve alongside a colorful salad. These little suckers stay very hot inside for a long time, be careful when serving little kids. If using raw chicken, cut it up very small and add it after the broth, simmer until it is cooked through. Tip: Slicing semi frozen chicken is easier than trying to slice raw chicken. Place your raw chicken in the freezer for 10 minutes and then slice away. Heat the oil in a large skillet over medium heat. When it shimmers, add the onion and cook, stirring occasionally, until translucent, 2 to 3 minutes. Add the carrot,potato and celery and season with salt and pepper to taste, raise the heat to medium-high. 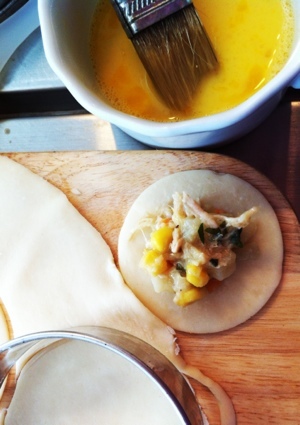 Cook until the vegetables are softened , add the corn and pre-cooked chicken. Sprinkle the flour over everything in the pan, stir, and cook for 1 minute. Add the broth, thyme and lemon juice, and simmer for 5 minutes more or until thickened. Transfer the mixture to a bowl, cool and refrigerate until cold, about to 30 minutes. Remove the pie crusts from the refrigerator so they can soften slightly. 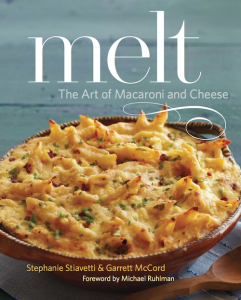 When the filling is cool, preheat oven to 4oo°F Grease or line two baking sheets with parchment. Lay the crust out on a cutting board. Use cookie cutter to cut as many shapes as you can. Re-roll the dough and cut more until you have no more crust left. Place about 1 Tbs. of filling in the center of dough, brush beaten egg around the outside of the crust, then place another matching shape in top. Crimp the edges together with a fork, and prick the top a few times for steam to escape. Carefully transfer pie to the prepared baking sheets. Repeat with remaining pie crust and filling. Just before baking brush all the pies with egg wash.
Bake until golden brown, 20 30 minutes. With Valentine’s Day approaching I thought you could use just one more pink recipe *wink, wink* yes, I know your thinking “Pink pasta again? ?” My answer is’ “Yes people, more pink pasta…can you really have too much pink?” My last post on Pink Pasta was a bit more complicated, this one is easy! This is a really easy way to wow your family. Are the kids asking for pasta AGAIN? OK, so give it to them but shock them this time. These are very easy ravioli made from Wonton skins and filling of your choice.We love spinach and what could be easier than frozen spinach and tofu try this on for size. If your kids are not very adventurous then just use a pinch of the lemon zest instead of a whole teaspoon. We like to add a little soy sauce or just some good olive oil and grated Parmesan on top. If you have extra filling save it and add it to your scramble in the morning or drop it in some chicken broth for a good healthy egg drop spinach soup. In a large pot bring about 6 cups of water and chopped beet to a boil, let simmer for 15 minutes. The water will be nice and pink. Assemble wontons following directions below. In a bowl mash all ingredients except wonton skins and beets with a fork. Put about 1 tablespoon of the filling near the corner of the wonton wrapper. Wet the edges of the wonton wrapper with water or beaten egg. 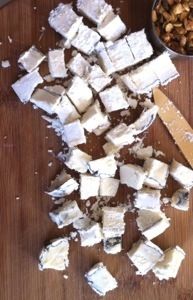 Pull the other corner over the filling, creating a triangle press and seal the edges together. Set finished wontons on an oiled baking sheet or plate. Assemble the rest until you run out of filling or wontons. You can either cook them immediately or put them in the fridge until later in the day. Make sure that they are well covered so that they don’t dry out. Bring water back up to a boil, add 1-2 teaspoons kosher salt . Add about 10 wontons, stir very gently and let the water come to a boil again. Cook about 4 minutes until the ravioli look droopy. 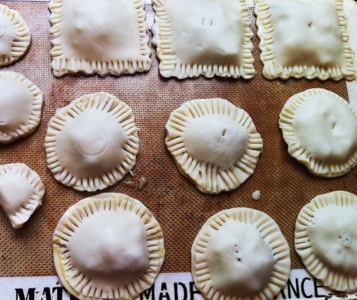 Lift the cooked ravioli from the boiling water with a slotted spoon and add another batch. Place them on a plate or shallow bowl and drizzle with olive oil to prevent sticking. Keep cooking until you have cooked all the wontons. Serve at once with desired sauce. 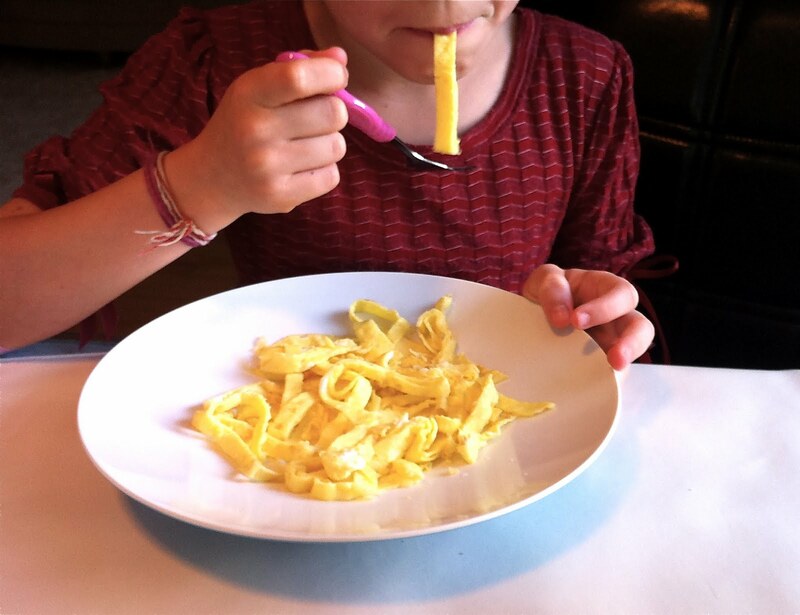 This morning my daughter asked if we could have “egg pasta” again soon, how ironic I told her because I was already writing this post! “Great minds think alike” I said! I think the summer has officially gone, it is starting to get cool and rain here in the San Francisco Bay. I thought I’d share a very easy sunny recipe with you. As I write this it is very sunny and warm but it wont last. 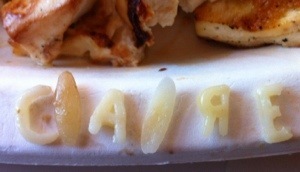 Nothing annoys me more than when my daughter asks for plain pasta for dinner. I may as well give her the sugar bowl and a spoon! Kids need a little more than plain pasta but sometimes we are in a hurry or just out of ingredients. We almost always have eggs in the house, it is our go to meal. We love eggs the good kind, the deep orange yolks from chickens that roam free and have personal groomers (no really I just couldn’t resist!) Just get yourself some great eggs, when you make a one ingredient dish that ingredient should be the best it can be. 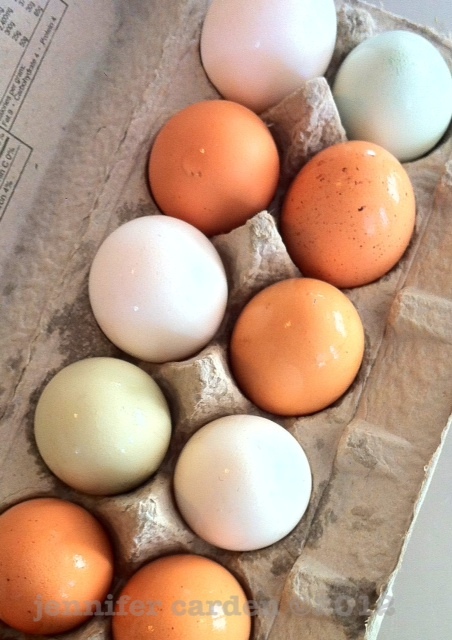 Eggs are great way to get some nutrition into a kid, but if they are picky or discerning then eggs may turn them off. Pasta will turn them right back on again, I can guarantee it. 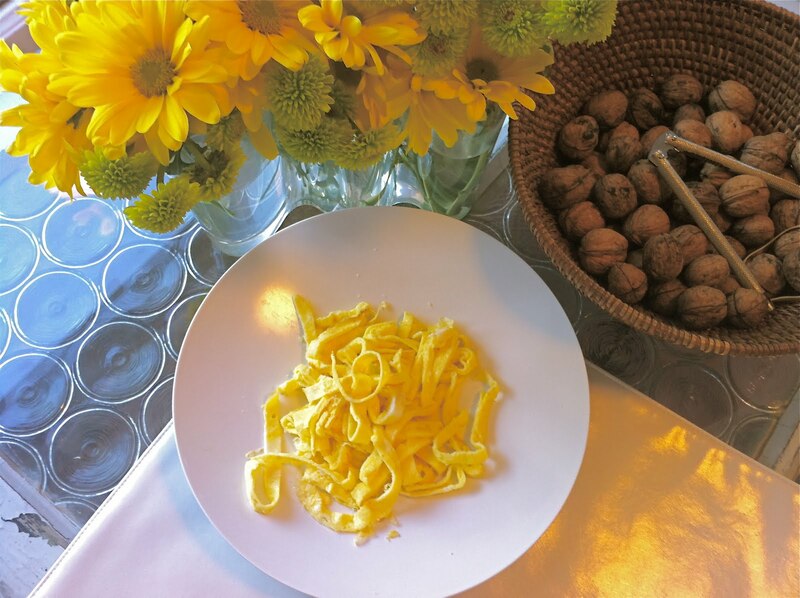 If making homemade pasta is not your thing this is the next easiest way to fake it and get them to eat eggs! 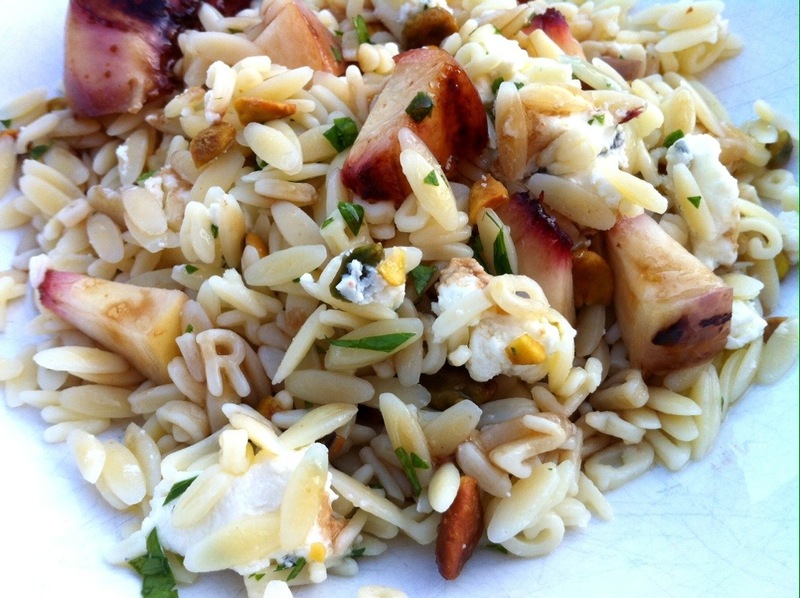 If they like this recipe it try tossing this with real fettuccine noodles upping the nutrition factor. Add peas and Parmesan for a little more flavor. Add cooked chicken or shrimp, or roasted carrots and ricotta cheese. 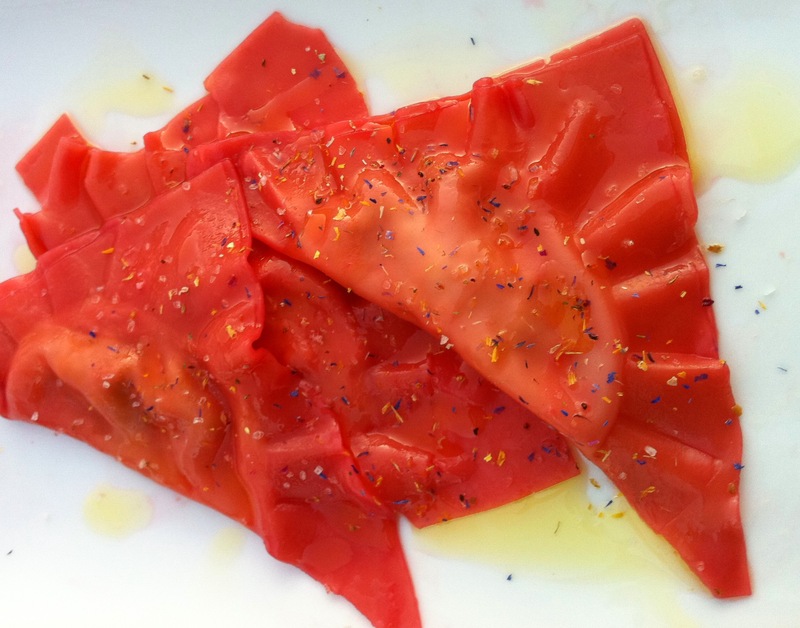 The way you get the ribbons is to treat he eggs like a crepe, cooking it as thin as you can. Use a very large pan so the egg spreads very thinly or else you will just end up with an omelet. 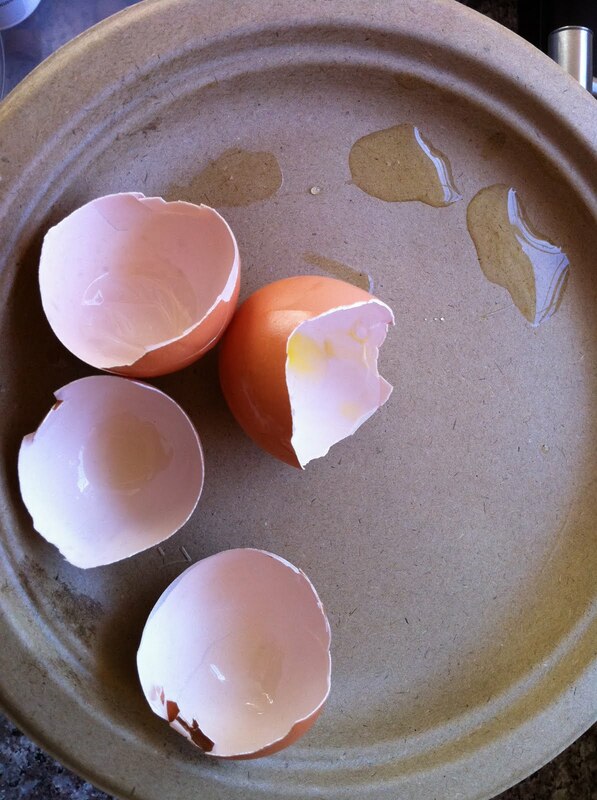 Crack the eggs into a bowl scramble very well. Heat a large 8 or 10 inch non-stick pan on medium add oil or butter coating pan thoroughly. Add egg and swirl immediately coating the whole pan. Cook on medium for about 30 seconds to one minute until cooked through. Pour out into a plate or cutting board. 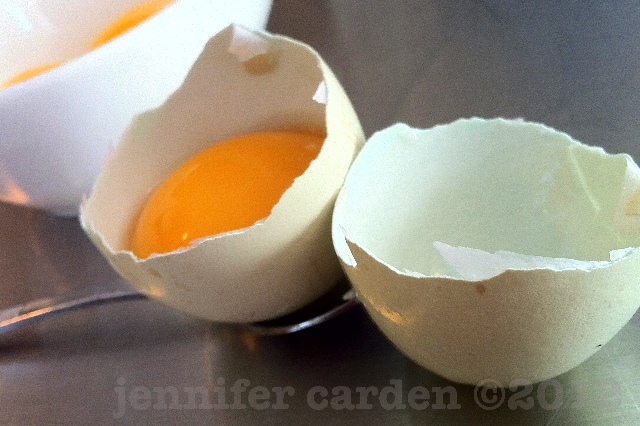 Roll the egg into a tight roll and cut 1/4 inch slices with a knife. They will be rolled up like little spirals, put on a plate, toss to unravel and serve! If you know me you know I am a breakfast junkie, I am a believer in high protein breakfasts for kids. I think they act better, think better and grow better. With good for you foods in the early hours of the day their brains function much better than with sugary or even no breakfast. Some kids just don’t like eggs so this is for kids who don’t like eggs. Call them nests! 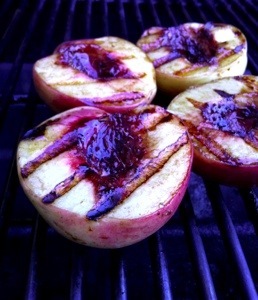 I saw this recipe on Simply Recipes and I instantly loved the concept. The original recipe called for Gruyere cheese but I happened to have a cheddar and jack blend so I went with that. 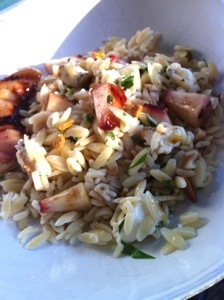 I have changed this recipe, I upped the servings and added a few tips of my own, enjoy! 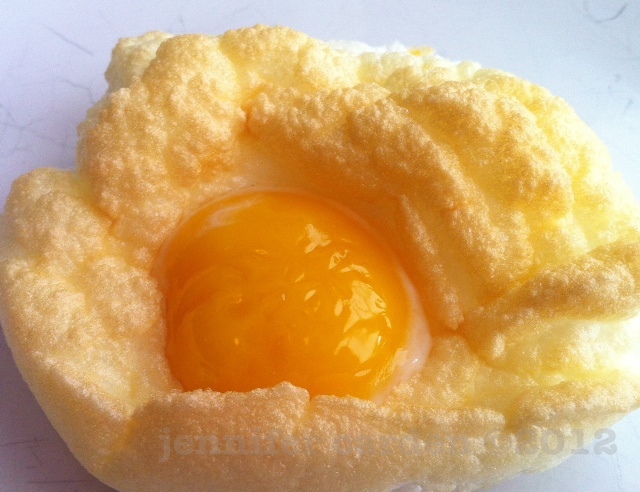 I like making a few extra smaller puffs (as we call them) ones without egg just to snack on! So snack on and on…. My daughter said it was the best breakfast EVER! I can’t wait to start experimenting with some other ideas using this technique stay tuned. Place the egg whites and salt in a very clean mixer bowl. Beat the egg whites with a whisk attachment in a mixer (or using a hand mixer), start on low speed working your way up to high speed, until stiff peaks form. Do not over beat the eggs here, you’ll want them silky not chunky. 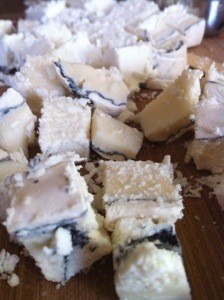 With a rubber spatula gently fold in the grated cheese, doing your best not to deflate the egg whites. Create four equal mounds (or more) of the egg white mixture on the lined baking sheet. Form the mounds so they look like nests, using the back of a spoon make indentations in the centers. Place nests in the oven for 3- 4 minutes until firm but not browned. 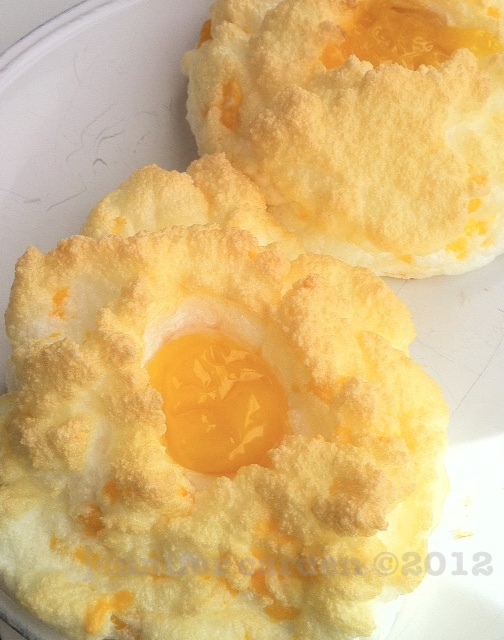 After 3 minutes, take the pan out of the oven and gently add an egg yolk to the center of each nest. Return the baking sheet to the oven and cook for 4 more minutes. Sprinkle with a small amount of salt. 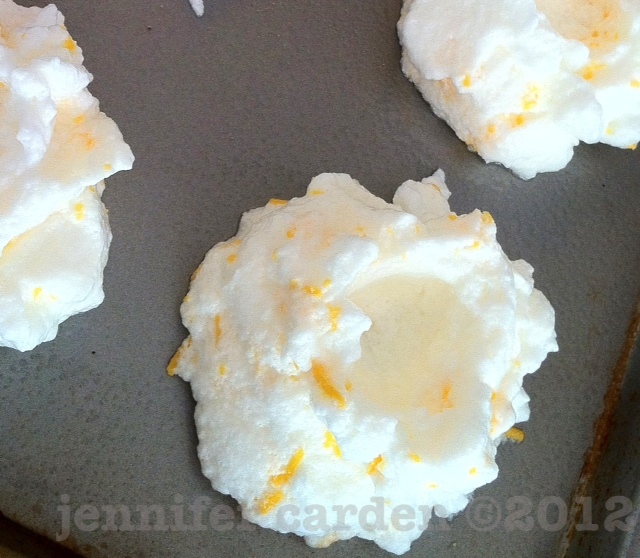 Tip* Make sure your egg whites are yolk free, free of any fat, the yolk will cause the whites to misbehave.